Oyraa is an online global platform of professional interpreters. 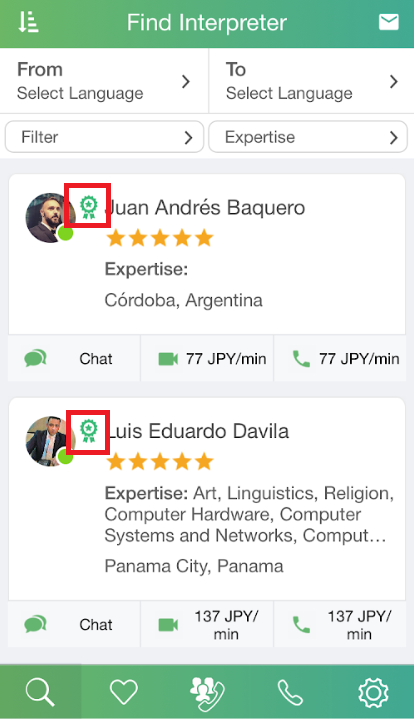 Oyraa removes the agency or the middleman in between and makes interpreters fully visible to a GLOBAL client base. As an interpreter, you get to use your skills and expertise either on-site or on-call (remotely). You get to chose your availability and where you want to work from. We bring you clients right through your phone. As a language service provider, you get to make your own pool of interpreters available to our clients through Oyraa. No more hustling and negotiating. Clients come to you. Plus, our special management portal for LSPs help your company process payments instantly. Why should I join Oyraa? Oyraa empowers interpreters around the globe by making it easier to work independently. You have complete control over your time and how much you charge. Create your own profile on Oyraa, upload your headshot, list the languages you can bridge, specify your fields of expertise, and set your own rates. And voila! 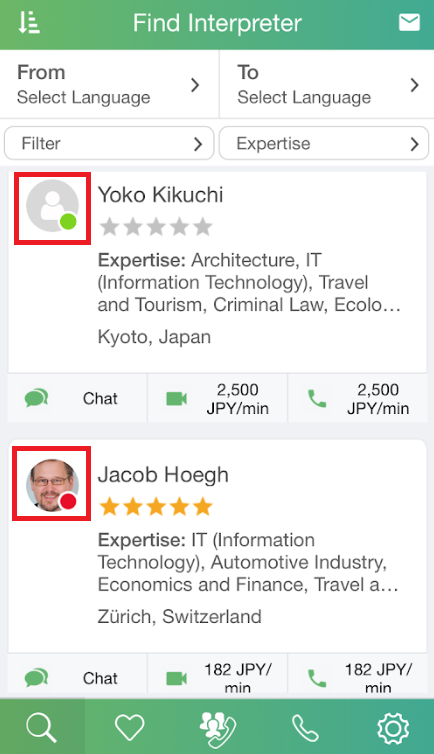 You get the freedom to set your own availability, organize on-site interpretations directly with clients and switch-on your profile to receive remote interpretation requests. We make it easier to go freelance and we give you the tools to succeed. How so? Forget the hassle and the hustle, we guarantee you instant clients and payments. Clients will pre-pay Oyraa for both on-site and remote interpretation services. As soon as the job is done, we free the money to your account. Oyraa will receive a 20% commission for on-call (remote) interpreting jobs. Sounds scary? No way! Just take it into account when you set up your per minute on-call rate. When a client schedules an on-site interpretation job, they pay upfront. Oyraa holds the payment until the assignment is completed. If the job ends up taking more hours, the client has the possibility to extend their contract. Oyraa will receive a 5% - 20% commission for on-site interpreting jobs depending on the volume of the transaction. You can cash-out your payments directly into your bank or PayPal account, whenever you please. How can I stand out from other interpreters? 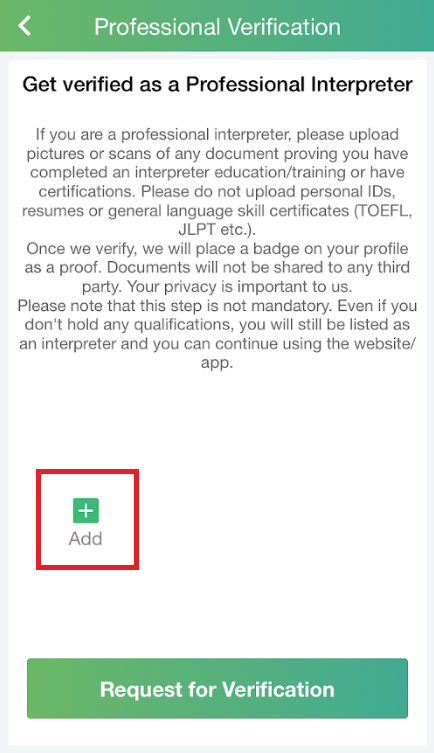 1.Using the Professional Interpreter badge on your profile: Submit documentation (picture/scan or copy) of your qualifications and certifications to Oyraa’s support team. 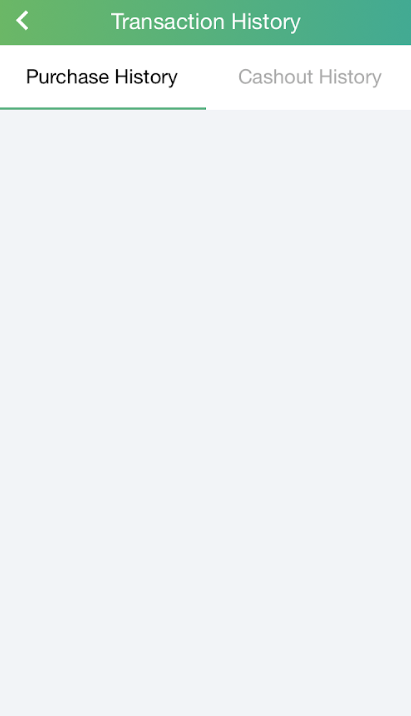 Once approved by Oyraa, you will receive a nice badge to show off on your profile. 2.Getting great reviews from your clients: Each on-site and remote interpretation service you provide, client’s will be prompted to answer a 5-star survey with the option to provide a brief comment of their experience working with you. Positive feedback will entice trust and quality service to future clientele. How do I manage my availability for remote interpretation jobs? 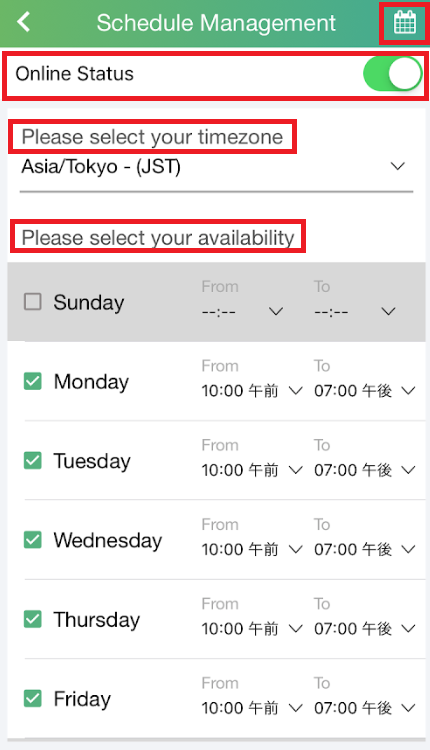 You have the possibility to switch on and off your availability. When on, you make yourself available instantly to our customers. If you mismanage this feature, you might get bad reviews on our platform. Managing your online and offline status allows you to use your idle times to make extra income. You can change this by clicking on “Settings” at the very top of your screen. In our quest for better customer experience, Oyraa keeps track of your responsiveness and makes it public. Having a positive response rating will help you get more jobs. Who decides my rates on Oyraa? As an interpreter, you get to set your own price per minute for remote interpretation. 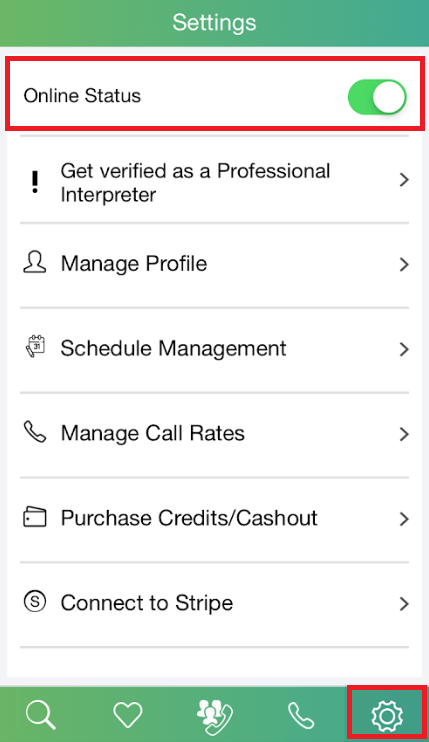 Oyraa offers transparency among interpreters, which means you can see the rates of your fellow interpreters within your expertise. Again, for on-site interpretation, you have the ultimate freedom to accept or reject an offer. You can even chat and negotiate your rate with your prospective clients. Oyraa is not an interpretation agency. By removing the middle-man, professional interpreters can build relationships with new and existing clientele. We empower interpreters with freedom and individuality; set your own rates, work your own flexible hours, and establish yourself within your niche by earning positive reviews from your clients. I am already a freelance interpreter. Can my current clients find me on Oyraa? Yes! Your current clients can join Oyraa and connect with you via the platform. Freelance interpreters using Oyraa don’t have to stress about negotiating or receiving their payments. We make sure everything runs smoothly for both parties. Will I be charged for the phone call? No – it’s in-app call! You don’t need a phone line. Any wifi connection would work. Therefore, you will NOT be charged for phone calls. 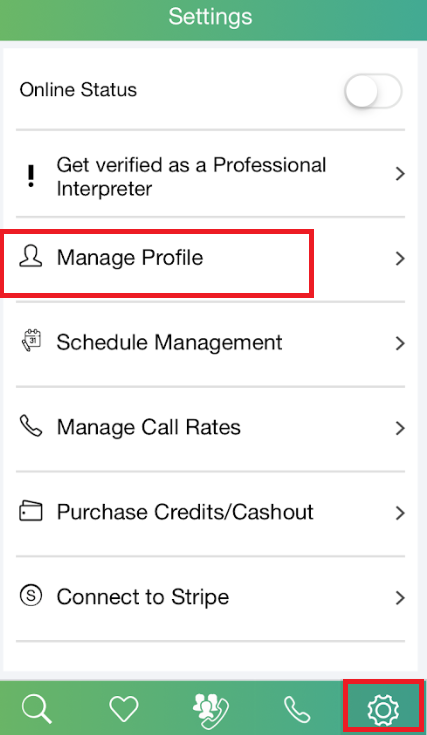 How do I sign-up to be an on-call interpreter? You can download our free mobile-application. Create an account, list the languages you can interpret, submit your certifications through Oyraa app or directly send to customer.service@oyraa.com, then switch your profile on whenever you’re available for work. Easy, peasy! How do I sign-up to be an on-site interpreter? 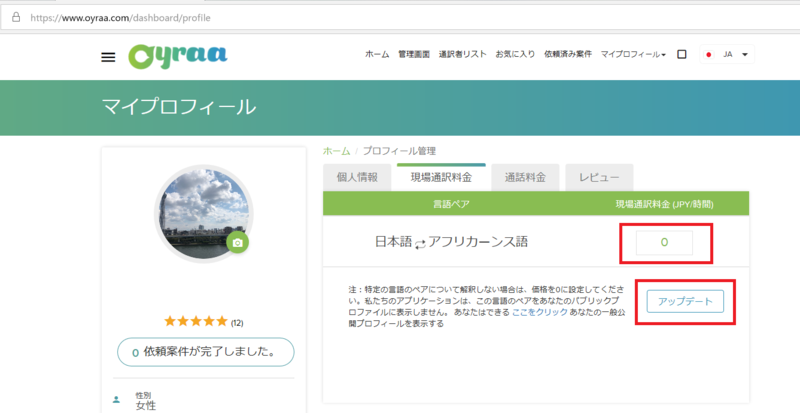 For now, this feature is only available through www.oyraa.com. We’re working on adding it to our mobile app so stay tuned! ** Both online and mobile platforms are synced, so when you sign up to use Oyraa, you’re immediately in it in both. How should I edit my profile on the app? How should I manage Online/Offline Status on the app? 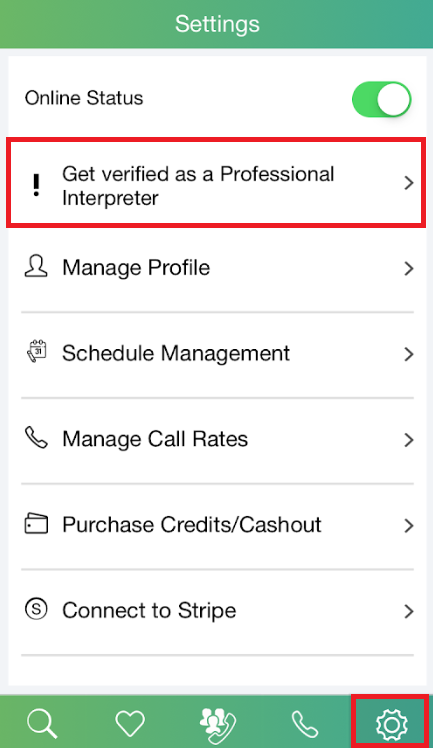 How can I be verified as a professional interpreter on Oyraa from the app? 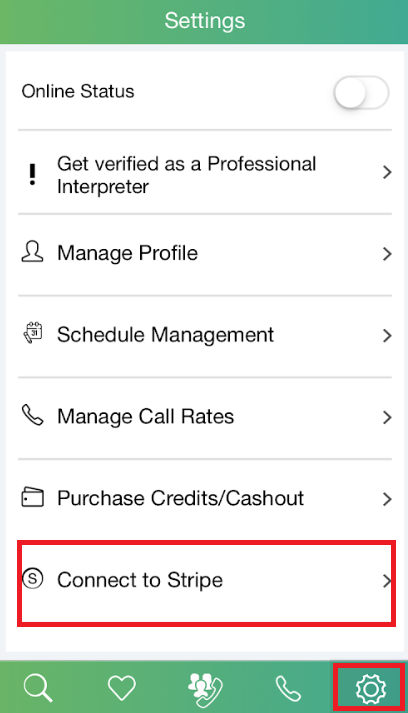 Please upload certificates or documents proving your interpreter education/training from [Get verified as a Professional Interpreter] in [Settings], the gear type icon at the bottom right of the app screen. The Oyraa team will review the documents and, if verified, a badge will be displayed on your profile. 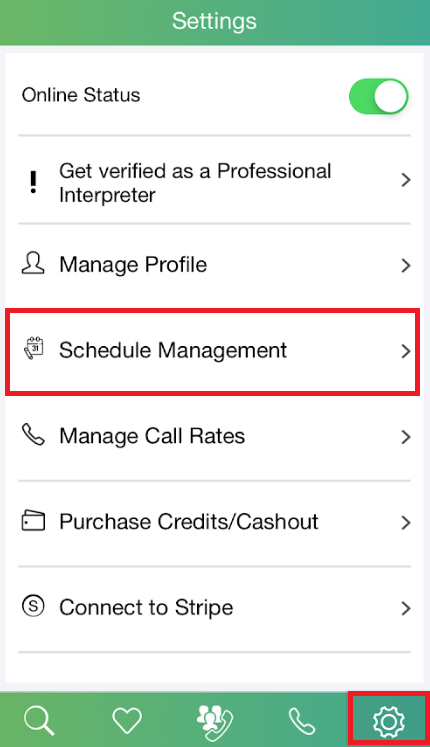 How can I manage schedule on the app? You can preset the available days and time from the bottom right of the gear shape icon at the app screen, [Settings] → [Schedule Management]. According to your availabities, the app will be online/offline automatically. If you want to go online / offline immediately regardless of the schedule, you can change it from [Online Status] at the top of [Schedule Management]. 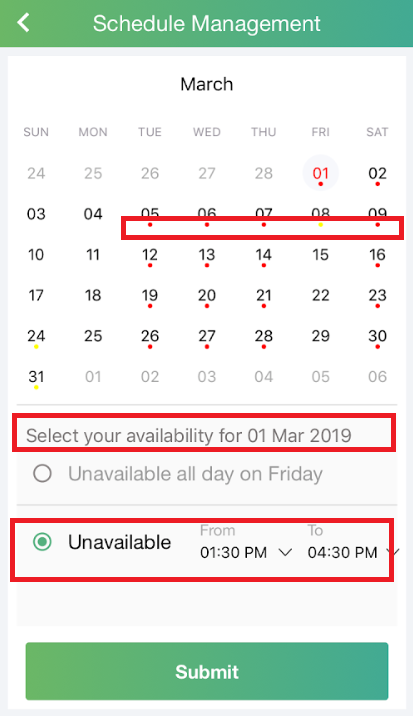 Also, if there is a day or time that can not be available besides preset schedules, click the calendar icon at the upper right of the screen, you can make settings for unavailable schedule and go offline. When that schedule is over, the online / offline setting will be back according to the pre-set regular setting schedule. *On the calender, the day when you are unavailable for a whole day will be indicated with red mark and a partially unavailable day will be indicated with yellow mark. How should I manage call rates on the app? 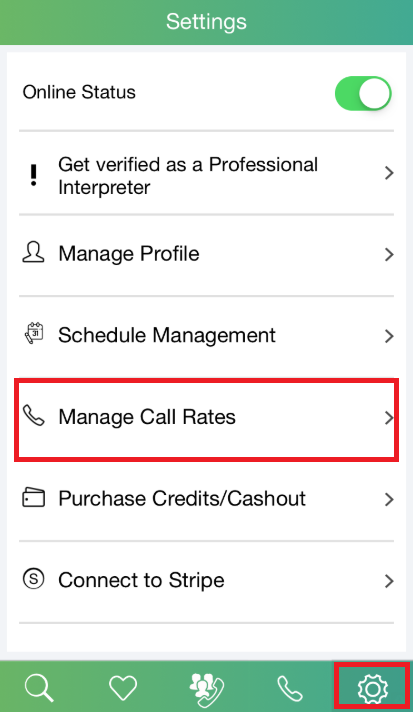 To set call rates, click the gear shape icon at the bottom right of the app screen and go to [Settings] → [Manage Call Rates]. You get to set your own price per minute. 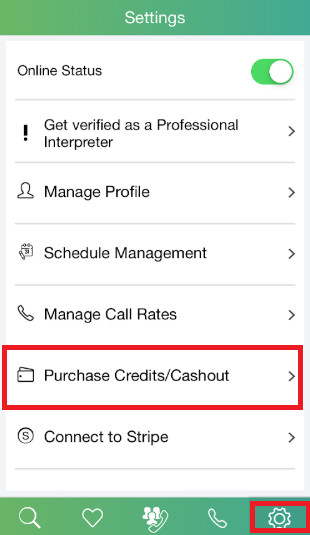 In deciding rates, you can refer to the rates of interpreters who are with the same language pair or specialized fields as yourself. 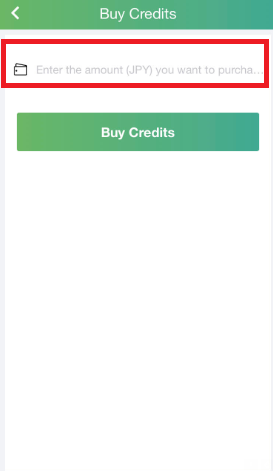 How should I purchase credits on the app? 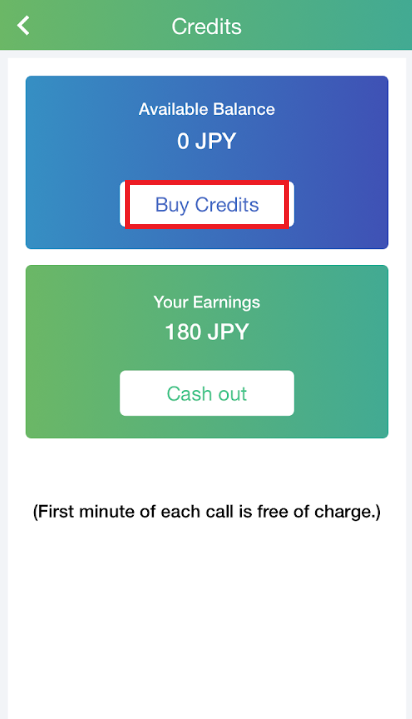 How should I set up the setting for cashout on the app? To receive the amount of remuneration added to your account, please register your bank account with Stripe connection setting, [Connect to Stripe]. Please also read further ”How should I connect to Stripe?" ＊It may take a few business days for the Stripe account to become verified. 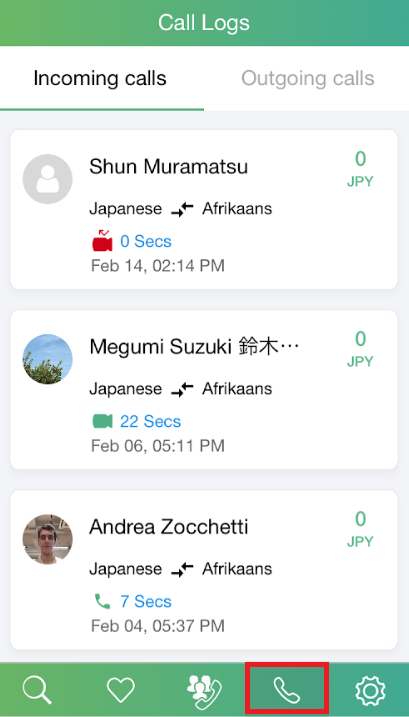 How should I connect to Stripe on the app? Click the gear shape icon at the bottom right of the app screen and go to [Settings] → [Connect to Stripe]. First, select the country. 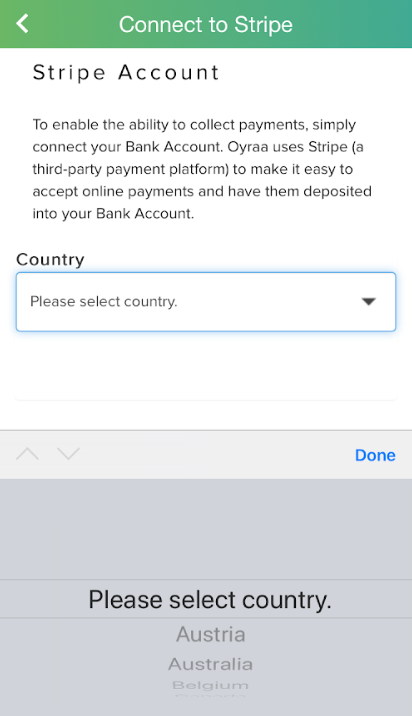 (Countries not shown in the pull-down are Stripe unsupported countries, in which case payment will be made via Paypal, so please contact customer support. customer.support@oyraa.com ) Enter necessary information according to the input screen and upload your personal identification document. When "Document Verification Status" of "Account Details" is changed to "Verified", Stripe connection setting is completed. 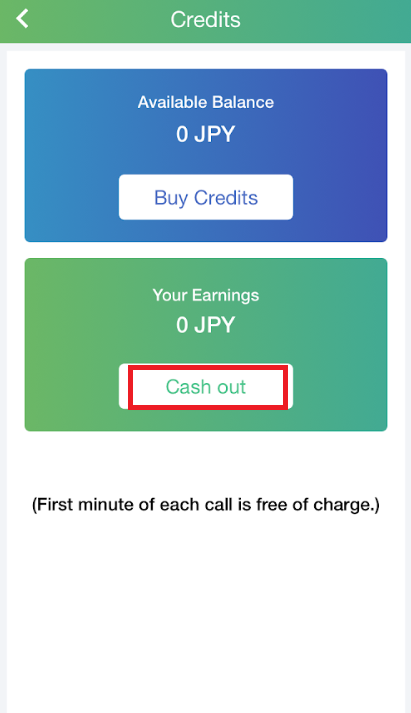 From [Settings] → [Purchase credits / Cashout], click on "Cash out" and generate a cashout request. ＊It may take several business days for the Stripe account to become verified. 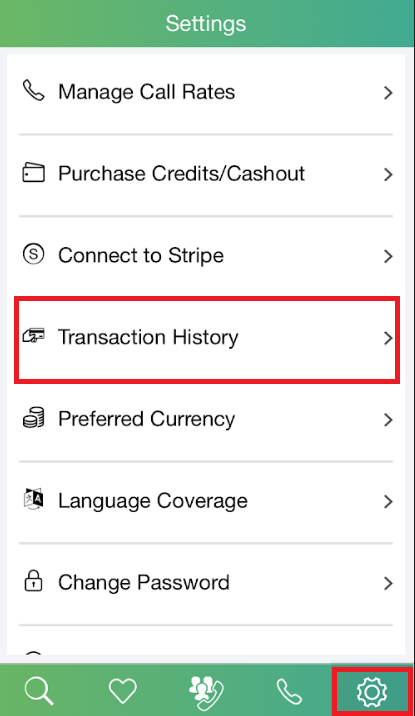 How can I check the transaction history on the app? Click the gear shape icon at the bottom right of the app screen and go to [Settings] → [Transaction History]. You can check the "Purchase History" of credits and "Cashout History". How can I check the call history on the app? Click the telephone shape icon at the bottom of the app screen and go to [Call Logs] . You can check "Incoming calls" and "Outgoing calls". Interpretation fee charged for the call is also indicated. Where can I manage on-site rates? Please set the price per hour. On-site rates setting is currently not available from the app, and can only be registered via the web page. What is the average data usage of a call on Oyraa? 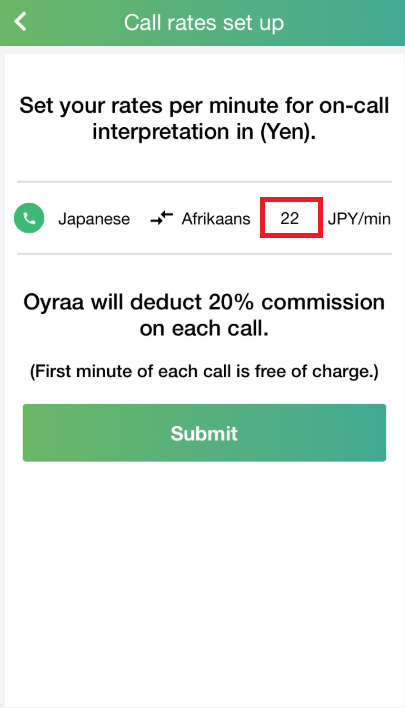 Oyraa uses around 0.3 MB/min for voice calls which is approximately the same amount of data as other apps like WhatsApp and LINE. Don’t have an account? Create a new account!